Overall approx. 66″ x 64″ x 1 5/8″thick Character Walnut wood. Sanded & finished by Brian Jr. using Boiled Linseed Oil. This type of finish penetrates the wood & really accentuates the grain, making it pop, as well as sealing and protecting the surface against damage. Once first applied, gives off a more golden hue and overtime turning more amber — but could vary a bit depending on the wood species. The finish is easy to take care of & easy to re-apply if necessary. Our popular Carlyle pedestal table was made 42″W x 66″L with a square oval shape top that extends to hold 4 leaves and features a subtle waterfall edge. Available in smaller dimensions, including 36″ round plus all of our other standard customization options – wood, finish, distressing, two toning, etc. 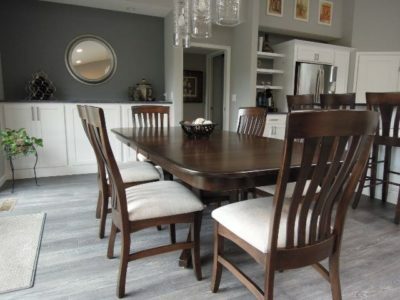 Paired with Richland dining chairs and coordinating Metro 30″H stools with easy to clean Crypton fabric seats. All in Hard Maple/Kona stain. Contact us to design a table set or seating arrangement to fit your needs. This beautifully designed, custom two drawer entryway table sits tucked right in a small nook inside the front foyer of this home. It measures 48″long x 35″high x 16″deep and features 2) large 18″ x 22″ raised panel drawers and a full bottom shelf. 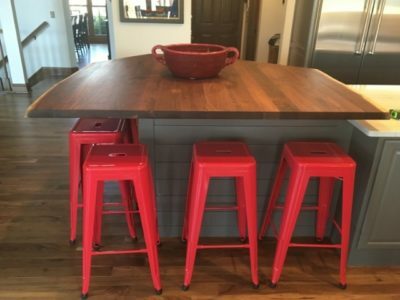 Our photo gallery displays other recently delivered, custom-designed pieces in real-life settings to help visualize some of the variations of materials & finishes available, as well as keeping you up to date on what’s trending. 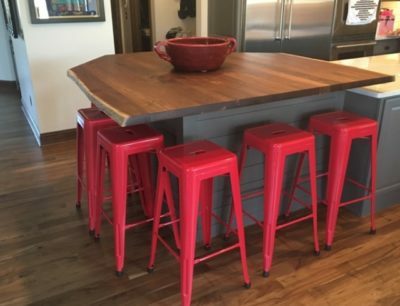 Similar products to the table above are featured on our entryway & occasional tables product pages. This custom designed “Hampton” style armoire sits right inside this customer’s grand entryway. It measures approximately 52″W x 25″D x 76″H overall and features traditional crown molding, turned legs, fluting, and reverse raised panels. Behind the two doors are adjustable shelves as well as a clothes rod to hang your coats on. And if you don’t think you have enough storage already, there are 2 drawers at the bottom for small items such as hats and gloves. 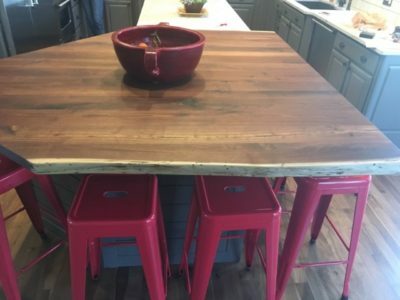 Our photo gallery displays other recently delivered, custom-designed pieces in real-life settings to help visualize some of the variations of materials & finishes available, as well as keeping you up to date on what’s trending. Similar products to the cabinet above are featured on our entryway products page. 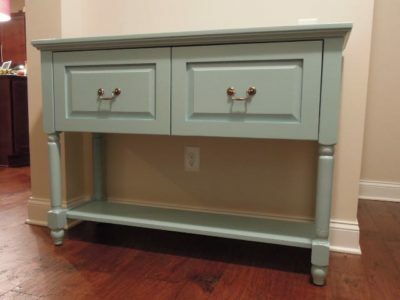 This beautiful custom shaker entertainment center measures 108″L x 89″H x 20″D overall. It features reverse raised panel doors, grey tinted glass doors, shaker crown molding, and simple, flat base molding. The TV opening is 60″W x 37″H. Brown Maple wood with our Antique Shadow stain. 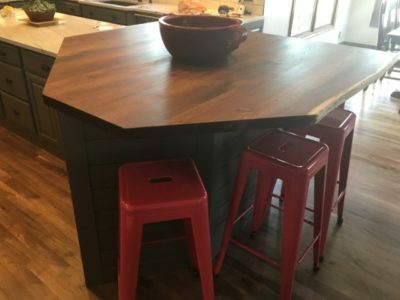 Our photo gallery displays other recently delivered, custom-designed pieces in real-life settings to help visualize some of the variations of materials & finishes available, as well as keeping you up to date on what’s trending. 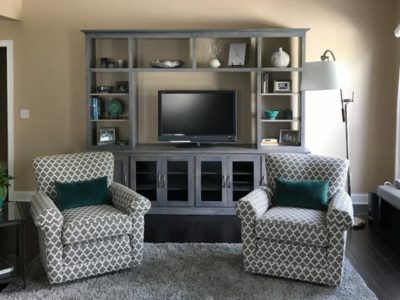 Similar products to the entertainment center above are featured on our entertainment product page.